The Russian-born French painter Nicolas de Stäel has gone down in history for his ability to combine figuration and abstraction at a time when the two concepts seemed irreconcilable. Stäel was born into a family of aristocratic origins that was forced to seek exile in 1919 following the Russian Revolution. After his parents died, from 1922 onwards Nicolas and his sisters were raised by a family living in Brussels, where he began to study interior design at the Académie Royale des Beaux-Arts in 1933, and architecture at the Académie de Saint-Gilles. During the summer of 1936 he made a visit to Morocco which, according to his letters, was decisive in steering him towards a style of his own, although very few of the works painted there survive. In 1937 he met Jeannine Guillou, who became his companion until she died in 1946, and travelled in Algeria and Italy with her. Stäel was conscripted following the outbreak of the Second World War, but after being discharged in 1940 he met up with Jeannine in Nice, where they coincided with a group of artists, among them Sonia Delaunay, Alberto Magnelli and Henri Goetz. Influenced by these contacts, his painting turned towards abstraction for the first time. In 1944, by which time he was back in Paris, the Galerie L’Esquisse staged his first one-man exhibition. Through the gallery owner Jeanne Bucher, whom he had met before the war, he came into contact with the Russian painter André Lanskoy whose textured, highly material surfaces greatly influenced him. At the end of the 1940s, Stäel began to consolidate his reputation and his improved financial situation enabled him to work in a larger studio. As a result his works increased in size and became less corporeal and more luminous and tranquil. He first exhibited his work in New York in 1950 and in 1953 signed an exclusive contract with Paul Rosenberg, a French gallery owner based in the city. From 1953 onwards Stäel returned to non-realistic figurative painting. He produced series of landscapes, footballers and still lifes, and although criticised by some, he never considered abstraction and figuration to be opposite concepts and defended the possibility that natural phenomena could be the basis for his works. During the last years of his life, he speeded up the pace of his production. 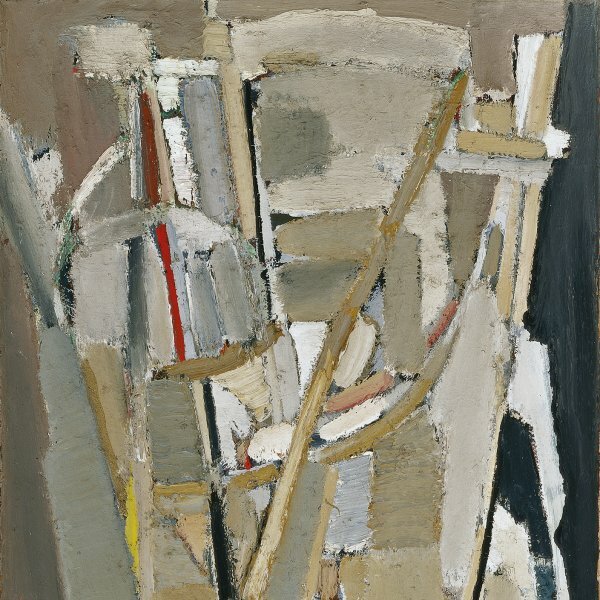 Even so, the pressure he felt at the growing demand for his paintings appears to have been the cause of his committing suicide in 1955, at the peak of his artistic career.